Eighteen Bridges is a magazine concerned with people, politics, culture, and ideas, its articles substantial and grounded in the tradition of narrative journalism. It was founded in 2010 by Curtis Gillespie and Lynn Coady with the goal to produce a magazine with the narrative power of The New Yorker, and the research standards and story scope of magazines such as Granta and Harper’s. Our tagline is, “stories that connect.” In keeping with our name and motto, Eighteen Bridges connects writers to readers by informing and entertaining. We work with writers, artists and editors from our neighbourhood and around the world. Eighteen Bridges has featured a stellar lineup of writers including Lisa Moore, Richard Ford, Chris Turner, Timothy Taylor, Caroline Adderson, Paul Wilson, Marni Jackson, Don Gillmor, Romesh Gunesekera, Bruce Grierson, Tim Bowling, Marina Endicott, Alissa York, Greg Hollingshead, Fred Stenson, Craig Taylor, Karen Solie, and many more. In the past five years, Eighteen Bridges has won multiple awards for its works of narrative journalism, essays, profiles, poetry, fiction and art. We won six gongs at the 2013 Alberta Magazine Publishers Awards and took home four gold medals and were the most-nominated magazine at the 2013 Western Magazine Awards. We have won many National Magazine Awards in Canada, including 11 nominations and four awards in 2014, three golds and a silver. 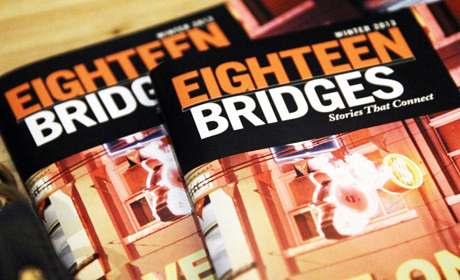 Eighteen Bridges uses great writers to tell enlightening and entertaining stories. We hope you enjoy it. To subscribe, click here. Visit Zinio to purchase digital copy of current and back issue. Follow @eighteenbridges on Twitter. Connect with us on Facebook.